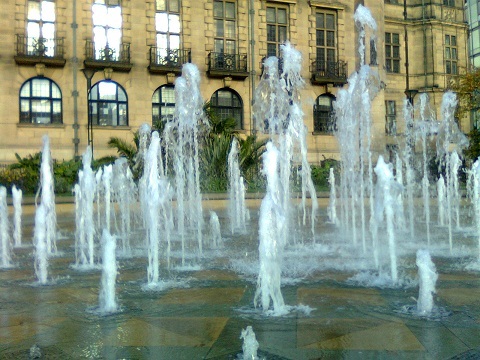 One thing you can say about Sheffield is that they love water there. From the stuff gushing down walls and cascades at the train station to the city centre gardens above, there seem to be fountains and water features everywhere. As I was in the city to attend a film festival, I didn’t get to see much of it, mostly dashing between the same few venues. But I felt right at home and kept forgetting I was ‘away’ for a few days – the fact that it’s only 2 hours by train from London helped. 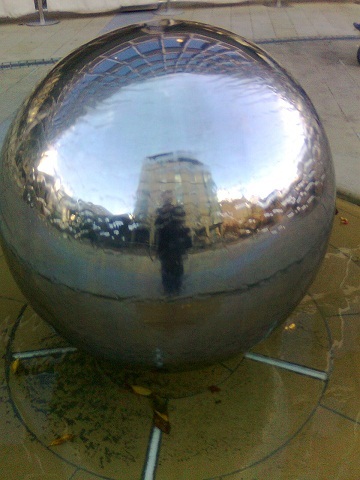 Self Portrait in Water Ball! So I can’t offer much in the way of a tour guide, but we did have to eat while we were there and I found a couple of gems that are worth mentioning. 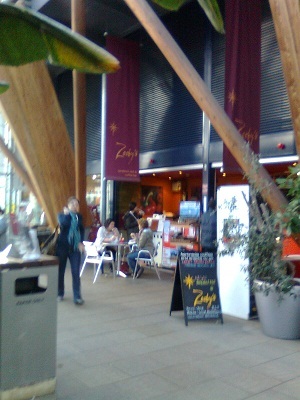 I also lunched a couple of times in Zooby’s in the Winter Gardens. To be sure, this wasn’t the cosiest venue in winter, but the cafe was very good value with jacket spuds less than £3 and veggie sausages available on their breakfast menu. The Winter Gardens is a bit like the temperate house in a botanical gardens with huge jungly plants weaving their way down the middle of the high-ceilinged building, a pathway amongst them if you’re feeling adventurous. The building isn’t kept very warm, but is nonetheless a welcome respite on a cold windy day! Other than that we ate in chains, the way you do in a new city without much time to explore and found ourselves in Pizza Express and Wagamama, which both have good veggie options, and Wagamama even has veggie wheat-free options if you can avoid the soy sauce! I’ll be keeping an eye on your site for those sneaky Hitchcock appearances! And the great recipes of course!